Department of Pharmaceutics, Al-Ameen College of Pharmacy, Near Lalbagh Main Gate, Hosur Road, Bangalore - 560027, Karnataka, India. ABSTRACT: The aim of the present study was to prepare solid lipid nanoparticles (SLNs) of azathioprine to increase its permeability and to develop azathioprine loaded solid lipid nanoparticles (AZA SLNs) based transdermal film for topical administration with the aim of reducing systemic and gastro-intestinal side effects of the drug and achieve passive targeting of drug to the joint due to enhanced permeability and retention (EPR) effect. Azathioprine SLNs were prepared by hot homogenization technique and optimized by 32 factorial design to evaluate the impact of the formulation variables on the dependent variables. Optimized formulation was evaluated for various in-vitro attributes and then incorporated into a transdermal film by a solvent casting method, which was evaluated for various technological properties and ex-vivo permeability study. Size of the optimized SLNs was found to be 113.3 ± 5.09 nm with 0.308 ± 0.008, polydispersity index (PDI) and encapsulation efficiency of 80.28 ± 1.29%. The in-vitro release studies of optimized formulation showed sustained release up to 24 h possessing biphasic pattern with a burst release during the first 8 h. Film loaded with AZA SLNs showed cumulative percent release (% CPR) of 78.97 ± 1.242% at the end of 24 h for formulation FT4 consisting propylene glycol and DMSO as a permeation enhancer. Drug-excipient compatibility studies revealed no drug-excipient incompatibility. Thus it can be concluded that transdermal film loaded with AZA SLNs represents a promising drug delivery system for the treatment of rheumatoid arthritis. INTRODUCTION: Rheumatoid arthritis (RA) is a chronic, immune-mediated inflammatory disorder of the synovial membrane affecting approximately 1% of the general population worldwide. It is characterized by inflammation of the synovial tissues, leading to the destruction of bone and articular cartilage of the affected joints 1, 2. There is no known cure for rheumatoid arthritis; the ultimate goal in the treatment of RA is pain relief. Agents that possess the ability to constantly reduce inflammation and maintain joint integrity, with minimum side effects that are manageable, are preferred for the treatment of RA, and this criterion is satisfied by DMARDs (disease modifying anti-rheumatic drugs). Azathioprine is the drug belonging to the class of DMARDs and is used for the treatment of severe, active rheumatoid arthritis 3. Azathioprine is an immunosuppressant, anti-rheumatic drug having low solubility and low permeability. Oral administration of azathioprine may cause serious side effects, such as bone marrow depression, leukopenia or thrombocytopenia, or less often anemia, hepatotoxicity, thrombocytosis, and also carcinogenicity. Another side effect, which is related to the direct contact of azathioprine with the gastrointestinal tract, is gastrointestinal toxicity manifested as nausea, vomiting, peptic ulceration, intestinal hemorrhage, and severe, life-threatening diarrhea. Therefore the topical application of azathioprine may minimize gastrointestinal tract side effects, by both decreasing the administered dose and avoiding the direct contact of the drug with the gastrointestinal tract 4. The dermal application offers many advantages over conventional oral delivery for medications such as allowing smooth and continuous drug delivery, reduces the maximum plasma concentration of the drug (Cmax), improves the tolerability profile and permit the achievement of relatively high local drug concentrations without systemic side effects. However, the amount of drug that can be administered transdermally is quite low since transdermal delivery is severely limited by the inability of a large majority of drugs to cross the skin at therapeutic rates due to the barrier imposed by the outer stratum corneum layer of the skin. SLNs enhance the transdermal transport of active substances as small particle size permits close contact of SLNs with the stratum corneum and thereby improve penetration of encapsulated drugs into viable skin. Size of the nanoparticles governs the movement of nanoparticles inside tissues 5. Inflammation in arthritis -induces 6- to 40-fold increase of blood joint barrier permeability. Nanoparticles ranging from 10 to 500 nm in size can leave the vascular bed and accumulate inside the interstitial space where the active drug can be released from a carrier. The increased vascular permeability in the target tissues is beneficial for successful application of passively targeted drug delivery strategies. Dermal application using nanoparticles enhances drug permeability through the skin. It is expected that drug systems using nanoparticles may provide an alternative strategy for increasing drug permeation, and size of nanoparticles may influence its accumulation in the joint due to the EPR effect. Therefore, topical drug delivery system using nanoparticles may provide better patient compliance than the oral and intra-articular drug delivery system 4, 5, 6, 7. Therefore the present study aimed to develop Azathioprine loaded solid lipid nanoparticles for topical administration as single dose therapy, to achieve controlled drug release, drug targeting to the specific site, and to reduce gastrointestinal and systemic side effects of the drug. Materials: Azathioprine was obtained from Machen private Ltd., Glyceryl monostearate (GMS), Compritrol 888 ATO and Precirol ATO5 was obtained from Gattefosse Pvt. Ltd., Tween 80, HPMC, PEG-400, Propylene glycol, and DMSO were purchased from SD fine chemicals. Sodium hydroxide and dialysis membrane from Hi-Media Ltd, India. The other chemicals were of analytical grade. Formulation of Azathioprine Loaded Solid Lipid Nanoparticles: Azathioprine loaded solid lipid nanoparticles were prepared by hot homogenization method. Lipid (GMS) was melted at 50 - 60 ºC and AZA (50 mg) was added to the melt. The melt was poured into 1% aqueous Tween 80 solution maintained at 50 - 60 °C (20mL). The resulting hot dispersion was stirred using magnetic stirrer for 5 min followed which the resulted pre-emulsion was subjected to high shear homogenizer (Ultra-Turrax) at 18,000 rpm for 10 min. The resulted nanoemulsion was cooled at room temperature to form the SLN. Then SLN were subjected to freeze-drying at -50 ºC under reduced pressure for 12 h to get a free-flowing powder 10, 11. 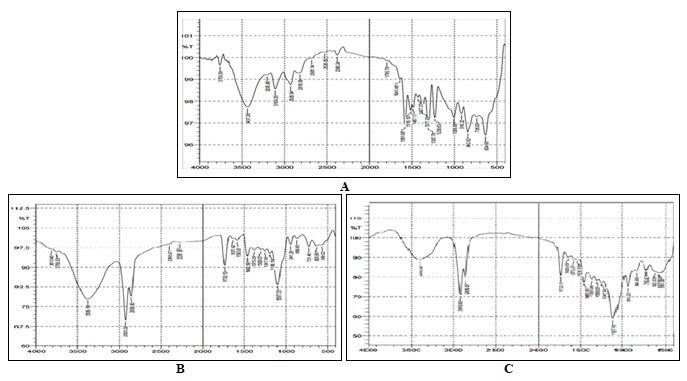 Standardization of Formulation Parameters and Process Parameters: SLN prepared with a drug to lipid ratio (1:9) by above-described method with varied process parameters like homogenizer rpm, duration of homogenization were fixed based on desired particle size and polydispersity index (PDI). Solid lipid nanoparticles were prepared with a different drug to lipid ratio, and surfactant concentration with 18000 rpm and duration of homogenization was standardized to 10 min respectively. Optimization of Formulation by 32 Factorial Design: Following the preliminary work which resulted in identifying crucial process and formulation variables the formulations were optimized according to a 32 full factorial design, allowing the simultaneous evaluation of two independent variables and their interaction. Two factors were evaluated each at two levels. The drug to lipid ratio (X1) and concentration of Tween 80 (X2) was selected as independent variables. The dependent variables selected for the study were particle size (Y1), % PDI (Y2) and entrapment efficiency (Y3). Further azathioprine loaded solid lipid nanoparticles were prepared in batches, F1 to F9 Table 7 12, 13. Determination of Particle Size and PDI: The particle size and PDI of the azathioprine loaded solid lipid nanoparticles were characterized using particle size analyzer (Malvern Zetasizer Nano S 90, UK). The obscuration level was set between 7 to 11 % distilled water was used as a medium. 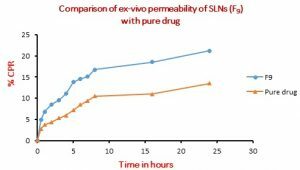 Determination of Total Drug Content and Drug Entrapment Efficiency: SLNs equivalent to 5 mg of drug was dispersed in 2 ml of DMSO preferentially to dissolve the free drug and centrifuged at 15,000 rpm for 10 min at 40 ºC. The amount of free drug was determined in the clear supernatant by UV spectrophotometry at 277.2 nm. The entrapment efficiency (EE %) could be achieved by equation 1. The residue was then dissolved in a mixture of hot ethanol and DMSO, to precipitate the lipid and dissolve the drug and further diluted with methanol and analyzed by UV spectrophotometry at 277.2nm (Hu. et al., 2010). The drug content (%) could be achieved by equation 2. Based on the particle size distribution, entrapment efficiency and drug content, formulations were selected for further studies. In-vitro Release Studies: In-vitro release of SLN formulations were determined by dialysis bag diffusion technique. Dialysis membrane (LA 401) having pore size 2.4 nm, molecular weight cutoff 12000 - 14000 (HIMEDIA), was used. Membrane was activated by soaking membrane in 1mM solution of EDTA, followed by soaking in 2% sodium bicarbonate for 20 min respectively, then finally soaked in distilled water for 2 h.
SLN equivalent to 5 mg of drug dispersed in a 1 ml of 5.5 phosphate buffer was placed in a dialysis bag and sealed at both ends. The dialysis bag was immersed in a receptor compartment containing 200 ml of pH 7.4 buffer which was stirred using a magnetic stirrer, and the receptor compartment was covered to prevent the evaporation of buffer. Samples were withdrawn at predetermined time intervals, and the same volume was replaced with fresh buffer to maintain the sink concentration. Samples were analyzed by UV spectrophotometer at 277.2 nm for AZA 14. Kinetics of Drug Release: To analyze the drug release mechanism, in-vitro release data were fitted into a zero-order, first order, matrix, Hixon-Crowell cube root law, and Korsmeyer-Peppas model. The criterion for selecting the most appropriate model was based on a goodness of fit test. 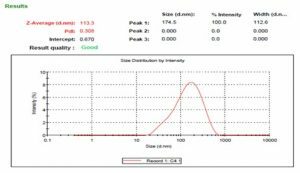 Determination of Zeta Potential: The zeta potential of nanoparticles was measured using Malvern Zetasizer Nano ZS (Malvern Instruments Ltd). Samples were diluted with distilled water in 1:10 ratio before measurement. The animals used were Wistar rats between the age group of 2-3 months, the animals were euthanized by cervical dislocation method. Freshly excised rat skin was collected, thoroughly washed with distilled water to remove the adhering tissue and fat, trimmed to the required size and used as the permeation barrier. The collected skin was placed in physiological solutions. SLN equivalent to a dose of the drug was placed on the skin, which was tied to the mouth of modified Franz diffusion cell, whose capacities were 85 ml and 2 ml respectively. The area available for diffusion was 4 cm2. The receptor chamber containing the sampling port was filled with phosphate buffer pH 7.4, while the donor chamber was filled with acetate buffer pH 5.5. The content of the cell was stirred with the help of magnetic stirrer at 37 °C. Samples were collected at regular intervals from the side tube of the receptor compartment, replaced with fresh buffer and analyzed for the AZA spectro-photometrically using phosphate buffer as blank 15. Incorporation of Azathioprine Loaded SLN’s into Transdermal Film: To obtain a suitable topical formulation for application, SLN were incorporated into a film. 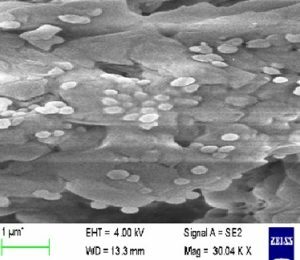 Azathioprine solid lipid nanoparticles loaded transdermal films were prepared by a solvent casting method using aluminum foil as the backing membrane for the preparation of films. The polymer (HPMC) was soaked overnight in 15 ml of water. Polyethylene glycol 400 (30% w/w of total polymer) was used as a plasticizer, DMSO and propylene glycol was used as a permeation enhancer, and SLN equivalent to 50mg of the drug was dispersed in the suspension. The resulting suspension was then dispersed uniformly over the petri-dish and dried in hot air oven at 40 ºC for 4 h followed by air drying for next 20 h Table 1 16. The thickness of the Film: The thickness of the drug-loaded film is measured at different points by using a screw gauge. Average thickness and standard deviation for the same was determined to ensure the thickness of the prepared Film. Weight Uniformity: The prepared films are dried at 60 °C for 4 h before testing. A specified area of the film is cut from different parts of the film and weighed in the digital balance. The average weight and standard deviation values are calculated from the individual weights. Folding Endurance: A strip of a specific area is cut evenly and repeatedly folded at the same place till it broke. The number of times the film could be folded at the same place without breaking gave the value of the folding endurance. Drug Content: Transdermal films of the specified area (4 cm2) were cut into small pieces and taken into a 50 ml volumetric flask, and 20 ml of methanol was added, gently heated to 60 ºC for 15 min. Then, the volume was made up to 50 ml. Similarly, a blank was carried out using a drug-free film. The solutions were filtered, and the absorbance was measured at 277.2 nm. Ex-vivo Permeation Study: Ex-vivo studies of the films were carried out across the excised rat skin (Wistar rat) as described earlier, using Franz diffusion cell containing required amount of PBS in the receptor compartment and a 4 cm2 of transdermal film containing azathioprine solid lipid nanoparticles was placed on the surface of the skin (the film exposed to the epidermis layer of the skin). Permeability studies were carried out throughout 24 h at regular intervals. Samples were withdrawn and analyzed spectrophotometrically. The release profile via rat skin was reported. All the experiments were performed in triplicate. FTIR (Fourier Transformed Infrared) Studies: Compatibility of the pure drug in the final nanoparticulate formulation and film was checked by taking an IR spectrum. The spectra were obtained using Shimadzu FTIR- 8700 spectrophotometer. In this study potassium bromide (KBr) disc method was employed. The sample was initially mixed with dry powdered potassium bromide. The mixture was then compressed into transparent disc under high pressure 5 ton for 5 min in a hydraulic press using dies. The disc was placed in IR spectrophotometer using a sample holder and was scanned over a frequency range of 4000 -400cm-1. 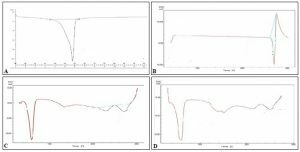 DSC (Differential Scanning Calorimetry) Studies: Differential scanning calorimetry studies were conducted using DSC Q2000. The sample was weighed (5.00-8.00 ± 0.5 mg) and placed in sealed aluminum pans, followed by heating under nitrogen flow which was maintained using liquid nitrogen evaporator at a rate of 50 ml/min at a scanning rate of 10 °C/min from 40 °C to 300 °C. The heat flow as a function of temperature was measured and recorded. DSC thermograms of pure Azathioprine and the AZA loaded SLN and film loaded with AZA SLN was taken. Screening of Lipids: From the result of lipid solubility test Table 2, it was concluded that lesser amount of GMS was required to solubilize the drug added completely, compared to other two lipids tested, i.e. compritrol 888 ATO and precirol ATO 5. Therefore GMS was selected for the preparation of Azathioprine SLN. 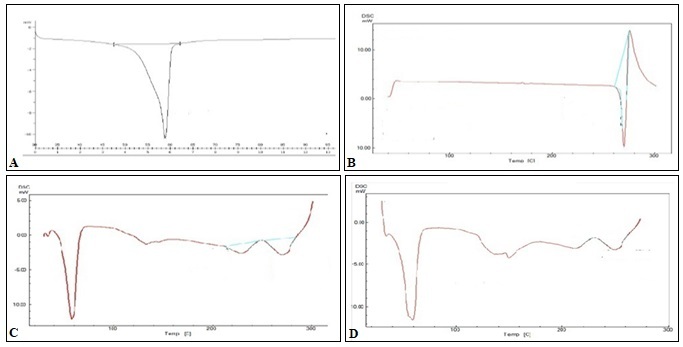 Formulation of Azathioprine loaded Solid Lipid Nanoparticles by Hot Homogenization Method: Glyceryl monostearate was selected as a lipid for preparation of Azathioprine loaded solid lipid nanoparticles because the AZA solubility was found to be maximum in GMS. Tween 20 was used as a nonionic surfactant that stabilizes the nanoparticles probably by a steric hindrance. Hot homogenization was selected because this technique is simple, fast, reproducible, scalable, economic, and applicable to lipophilic drugs, exposure to high temperature is short and one of the easiest procedures for the preparation of nanoparticles of less than 200 nm. 17. As the particle size of less than 200 nm is required for the selected drug since, as the selected size is expected to influence the nanoparticles (drug) accumulation in the joint due to the EPR effect. Standardization of Process Parameters: Homogenization Speed (rpm) and Time: Different process parameters like homogenizer speed, duration of homogenization were investigated and fixed based on particle size and polydispersity index (PDI) Table 3. The results indicated that when homogenization speed was increased from 12000 to 18000 rpm particle size decreased because of the high intensity of shear force acting on the particles which overcome the intraforces acting in the particles resulting in a reduction of particle size 18. With further increased in RPM the particle size was found to be constant. So, 18000 RPM was used for further preparation of SLN. Effect of duration of homogenization on particle size revealed that particle size reduction was achieved up to a particular time point with a fixed rpm, but later on the increasing duration of homogenization, particle size has undergone negligible change. F3 with homogenization duration of 10 min was found to be optimum with a particle size of 190.4 nm. Selection of Drug: Lipid Ratio: Different batches were prepared with the drug: lipid ratio 1:3, 1:5, 1:7, 1: 9 and 1:11 (i.e., F10 to F14) and evaluated for particle size and PDI. Batches F10, F11, F12, and F14 showed particle size greater than 200 nm Table 4. Since the required particle size was less than 200nm, these criteria were satisfied by batch F13, therefore this ratio was subjected to factorial design. Selection of Tween 80 Concentration: Different batches were prepared with different concentrations of Tween 80 (0.5, 1, and 1.5%) and evaluated for particle size and PDI Table 5. It was found that with an increase in Tween 80 concentration from 0.5 to 1 %, the particle size was decreased. But further increase in Tween 80 concentration led to an increase in the particle size. Therefore Tween 80 concentration was standardized to 1% and subjected to factorial design. Optimization of Formulation by 32 Factorial Design: To optimize drug: polymer ratio and concentration of Tween 80, a factorial design was adopted. To study all the possible combinations of both factors at all levels, a two factor, three-level full factorial designs were constructed and conducted in a fully randomized order. A full factorial design with design expert 8 was applied to study response surface of 3 level factorial design with 9 runs in the quadratic model. The formulations were fabricated according to a 3² full factorial design, allowing the simultaneous evaluation of two formulation variables and their interaction Table 7. The effect of two factors A (Drug: lipid ratio) and B (Tween 80 concentration) on the response of Y1 (particle size), Y2 (PDI), and Y3 (Entrapment Efficiency) was studied by a polynomial equation. Where Y is the dependent variable, b0 arithmetic means response of nine batches, and b1 estimated coefficient for factor A. The main effects (A and B) represent average result of changing one factor at a time from its low to high value. The interaction term (AB) shows how the response changes when two factors are simultaneously changed. The polynomial terms (A2 and B2) are included to investigate non-linearity. The validity of the developed polynomial equations was verified by preparing extra design check point formulation (C). Influence of Drug: Lipid Concentration on Particle Size, PDI and Entrapment Efficiency: It has been reported previously that mean particle size increases with increasing lipid concentration in solid lipid nanoparticles systems because there is the tendency of lipid to coalesce at high lipid concentration 19. The increased amount of GMS caused a decrease in the particle size, GMS appears to have the opposite effect, and the formation of smaller particles was favored with increasing both lipid and surfactant concentrations. This may be related to the co-surfactant properties of GMS which further reduces the surface tension and probably promotes a higher rate of the partition of the particles during preparation. Increase in the lipid concentration; there was a decrease in PDI. With increasing the amount of GMS, % EE is bound to increase, because of the increased concentration of mono-, di-, and triglycerides that act as solubilizing agents for highly lipophilic drug and provide more and more space to accommodate excessive drugs 20, 21. Influence of Surfactant on Particle Size, PDI and Entrapment Efficiency: On increasing the concentration of Tween 80, the particle size was decreased. This might be due to the reduction in surface tension and stabilization of newly generated surfaces by surfactant, which prevents particle aggregation 22. The surfactant level also has a significant and positive effect on the entrapment efficiency. Increase in the concentration of the surfactant increased the entrapment efficiency. This may be due to an increase in the solubility of the drug in the lipid on increasing the concentration of the surfactant 23, 24. Combined Effect of Drug: Lipid Ratio and Surfactant Concentration on Particle Size and Entrapment Efficiency: The response surface plots Fig. 1 illustrate that as the increase in the amount of GMS and Tween 80 concentration caused a decrease in the particle size. This may be related to the co-surfactant properties of GMS and reduction in surface tension and stabilization of newly generated surfaces by surfactant, which prevents particle aggregation. The entrapment efficiency was significantly increased by increasing the amount of surfactant and lipid. This effect was, probably due to the increased viscosity of the medium, because increasing the amount of lipid resulted in faster solidification of the nanoparticles. This would also prevent drug diffusion from the external phase of the medium. As the percentage of surfactant increased, part of the azathioprine was incorporated in the surfactant layer at the surface of the SLN, leading to a high entrapment efficacy Fig. 1. Particle Size and PDI: Particle size analyses of all the formulations (F1-F9) were carried out using Malvern particle size analyzer. All lipid nano-particles were found in size range between 102.3 nm to 380.6 nm. The polydispersity index (PDI) was found to be between 0.308 to 1.00 Table 8. PDI below 0.3 indicates uniformity in the size distribution. A PDI of less than 0.3 is good, 0.3 to 0.7 is acceptable. 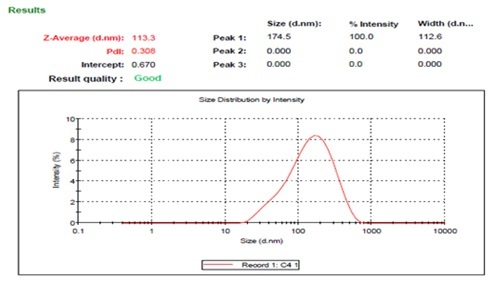 Formulation F9 has a PDI of 0.308, which shows excellent homogeneity. From the Table 8, it is revealed that lipid concentration did not have any significant effect on PDI but increase in surfactant concentration from 0.5 to 1% there was a decrease in PDI but further increase in the surfactant concentration there was an increase in the PDI. From Table 8, it is revealed that as a drug: lipid ratio increased from 1:8 to 1:10 particle size decreased significantly, and as Tween 80 concentration is increased particle size decreased. Therefore F9 formulation was found to be most satisfactory as it possesses a particle size of 113.3 and PDI of 0.308 Fig. 2. Drug Content and % Entrapment Efficiency: All formulations were evaluated for drug content and % entrapment efficiency. Drug content was found to be between 74.56 to 80.45%. Entrapment efficiency was found to be between 54.2 to 82.37%. High entrapment efficiency was observed because the drug is highly lipophilic. From Table 8, it is revealed that an increase in drug: lipid ratio and surfactant concentration led to an increase in the entrapment efficiency. The results of particle size and entrapment efficiency indicate that F3, F6, and F9 formulations were found to be most satisfactory and hence were subjected to in-vitro drug release. In- vitro Release Studies: Drug release from solid lipid nanoparticles and subsequent biodegradation are important for developing successful formulations. Diffusion and biodegradation govern the process of drug release. 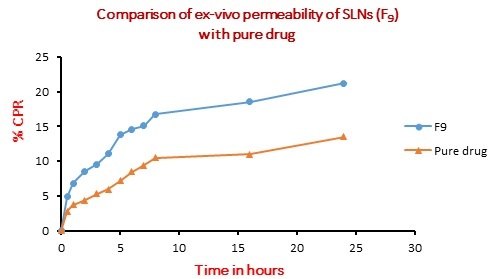 The in-vitro drug release behavior of Azathioprine loaded SLNs was investigated using a dialysis bag having pore size 2.4 nm, molecular weight cutoff 12000 - 14000 (HIMEDIA) in pH 7.4 (37 ± 2 ºC). The release of the F3, F6, and F9 formulations was compared with the pure drug as shown in Fig. 3. 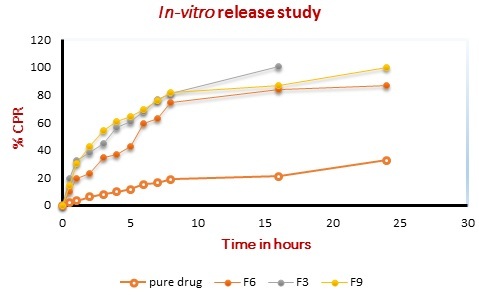 Free Azathioprine exhibited a total release of 34% of the drug at the end of 24 h. Formulations F3, showed 100.8 ± 2.467, of drug release at the end of 16 h.
However, formulation F6 and F9 showed 86.51 ± 0.384 and 100 ± 2.083% of drug release at the end of 24 h. A high log P value of AZA indicates its lipophilic nature; therefore there was delayed release whereas the AZA SLNs formulations showed increased in the release, as the mono-, di- and triglycerides present in GMS helps to increase the drug solubility and hence achieve desired drug release. A similar report has been made by other researchers as well 25. Thus, the in vitro release data indicated that the optimized nanometric SLNs of azathioprine was capable of controlling and achieving the desired release. The results also displayed that the release was chiefly dependent on the concentration of the surfactant. Increase in the surfactant concentration increased the release rate. Data obtained from in-vitro release study showed that F9 formulation was found to better than the other two formulations since it sustained the release of the drug for a longer period, i.e. for 24 h. The release profile of formulation F9 indicated a biphasic pattern with a burst release during the first 8 h, followed by a sustained release over 24 h. The initial fast release of drug from the SLN could be explained by drug desorption from the outer surface of the SLN, and the larger specific surface of the smaller particles is increasing the initial drug release rate. Thus, in-vitro studies proved that F9 has better drug release, in addition to desired particle size and good entrapment efficiency in comparison to other formulations. All these factors indicated that F9 was the best formulation. Hence F9 formulation was chosen for further investigations of SEM, Zeta potential, DSC, ex-vivo permeability and finally incorporated in a transdermal film and evaluated. In- vitro Release Kinetics: The mechanism of drug release from SLNs is determined by different physicochemical phenomena. To establish the mechanism of drug release, the experimental in vitro drug release data were fitted to zero-order, first order, Higuchi and Korsmeyer - Peppas model. Optimized formulation F9 showed the best fit for the matrix model with an R-value of 0.9803 for Azathioprine. Scanning Electron Microscopy (SEM): Scanning electron microscopy (SEM) studies were carried out for the best formulation F9. The particles were found to be oblate spheroidal as shown in Fig. 4. Zeta Potential: Zeta potential of the nanoparticles indicates the stability. Zeta potential in the range of -15mV to -30mV is common for well-stabilized nanoparticles 26, 27. The zeta potential of the F9 formulation was found to be -26.15mV Fig. 5 indicating the prepared solid lipid nanoparticles were stable. 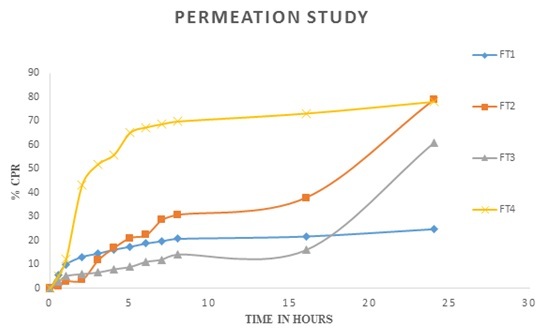 Permeation Study of Optimized Formulation: Permeation studies were carried out using freshly excised abdominal rat skin.The % CPR at the end of 24 h was found to be 21.20 ± 0.001 for formulation F9 Fig. 6. Although the pure drug and SLNs are lipophilic, the permeability of SLNs was higher compared to the pure drug as the small particle size of SLNs permits close contact with the stratum corneum and its occlusive property which decreases transepidermal water loss and thereby improve penetration of encapsulated drugs through the stratum corneum 28, 29. Incorporation of Azathioprine loaded SLNs into Film: HPMC was used as a polymer to prepare the transdermal film. As HPMC is highly hydrophilic, therefore lipophilic SLN is not soluble, and structure of nanoparticles remain intact 30. The thickness, weight variation and drug content values of the formulation made are shown in Table 9. The drug content per film was found within 92 to 95% per film. Folding endurance values of matrix films found more than 150 indicating good strength and elasticity, which is explained by the linear nature of the cellulose structure. The surface pH of all formulations was in the range of 5.5-6.5, the pH range of skin and hence no skin irritation was expected. The % CPR at the end of 24 h was found to be 24.79 ± 0.7477 for formulation FT1. Therefore to increase the permeation of Azathioprine SLNs via the skin, different formulations coded as FT2 - FT4 were prepared to contain different permeation enhancers and the combination of permeation enhancers. The formulation FT2 and FT3 contain DMSO and Propylene glycol as a permeation enhancer. The % CPR at the end of 24 h was found to be 78.97 ± 1.242 and 60.86 ± 2.510 for formulation FT2 and FT3 respectively Fig. 4c. The permeability of SLNs in FT2 formulation containing DMSO as permeation enhancer was increased, because the high osmotic activity of DMSO may distort the structure of the stratum corneum and induce channel and such channels would promote the passage of various compounds. 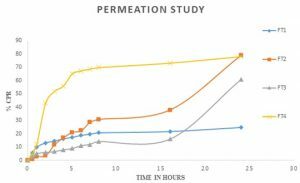 The permeability of SLNs in formulation FT3 containing propylene glycol as permeation enhancer was increased. As propylene glycol act by the solvation of keratin within the stratum corneum by competition with water for the hydrogen bond binding sites and the intercalation in the polar head groups of the lipid bilayers are postulated as mechanisms of action for the penetration enhancing effects of propylene glycol in the literature 31. But the enhancement in permeation of SLNs with DMSO and Propylene glycol was not gradual, and up to the requirement, therefore formulation FT4 with a combination of permeation enhancer was prepared. The % CPR at the end of 24 h was found to be 78.97 ± 1.242 for formulation FT4 Fig. 7 as this may due to the synergistic action of propylene glycol and DMSO as a permeation enhancer. Compatibility Studies: FTIR: FTIR technique was used to study the physical and chemical interactions between drug and excipients. 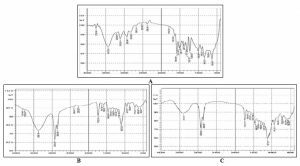 The characteristics peak in IR spectrum of azathioprine are at 1230, 1487, 1581, 2928 and 3109 cm-1 is due to C-N stretching, C-H bending, C=N stretching, C-H stretching and N-H stretching respectively. It has been observed that there were no major shifts in the spectral values of the drug, indicating no chemical interaction Fig. 8. Hence, it can be concluded that the drug maintains its identity without undergoing any interaction with the excipients used for the preparation of SLNs and Film. DSC Study: The pure GMS thermogram showed a characteristic sharp peak at 59 ºC corresponding to the melting of the lipid.The melting endothermic peaks of lyophilized AZA-SLNs appeared at 59.0°C, 228 °C, and 271 ºC. The diffuse melting endotherm of the drug in SLN suggested reduced crystallinity of AZA/partial amorphization of the drug in the lipid matrix/encapsulation of drug in the lipid matrix, further justifying the selection of lipid. FT4 formulation showed a characteristic peak at 59 ºC confirming the solid crystalline state of the lipid inside the prepared film. No change in the shape of the GMS peak was observed in the film formulation Fig. 9. CONCLUSION: Solid lipid nanoparticles of azathioprine with a narrow particle size range of <200 nm were successfully developed by hot homogenization method using glyceryl mono-stearate as lipid and Tween 80 as surfactant after an elaborate standardization of process and formulation parameters, further optimizing the formulation parameters by 32 factorial design. The nanoparticles were evaluated for various technological parameters like particle size, polydispersity index, entrapment efficiency, drug content, in-vitro release, and ex-vivo permeability. It was found that the nanoparticles were smooth, oblate spheroidal, < 200 nm in size and were highly stable. They depicted a prolonged drug release of 100 ± 2.083% for 24 h, which was three folds higher than the pure drug. Upon achieving the desirable characters of these solid lipid nanoparticles, a transdermal film loaded with these nanoparticles was prepared using HPMC as a film formed by a solvent casting method. Thickness, folding endurance, weight variation, and drug content were evaluated which proves that the transdermal films possess all the desirable physical characteristics. The amount of drug permeated at the end of 24 h was found to be 78.97 ± 1.242% for formulation FT4 containing DMSO and propylene glycol as a permeation enhancer. Hence, it can be concluded that transdermal film loaded with AZA SLNs can prove as a platform for not only minimizing the drug-related problems like low solubility and low permeability but also helps in acquiring various advantages like maintaining the effective therapeutic drug concentration for a prolonged period, overcoming the gastrointestinal side effects, extending its half-life, and indirectly minimizing drug administration frequency. These aspects will greatly enhance the therapeutic efficacy, safety and thereby will provide improved quality of treatment along with high patient compliance. 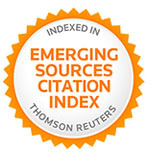 ACKNOWLEDGEMENT: The authors are grateful to Machen Product India Pvt. Ltd., (Mumbai) India, for providing the gift sample of AZA and Gattefosse Pvt. Ltd., for providing samples of Glyceryl monostearate (GMS), Compritrol 888 ATO and Precirol ATO 5. Special thanks to IISC Bangalore, for carrying out SEM and Zeta potential analysis. Firestein, GS: Evolving concepts of rheumatoid arthritis. Nature 2008; 423: 356-61. Sokka T, Abelson B and Pincus T: Mortality in rheumatoid arthritis: 2008 update. clinexp rheum 2008; 26: 35-61. Nagai N, Yoshioka C and Ito Y: Topical Therapies for Rheumatoid Arthritis by Gel Ointments containing Indomethacin Nanoparticles in Adjuvant-Induced Arthritis Rat. J Oleo Sci 2015; 64(3): 337-346. Tashtoush BM, Al-Safi SA and Al-Fanek KJ: Azathioprine transport through rat skin and its immunosuppressive effect. Pharmazie 2004; 59: 143-146. Shaji J and Lal M: Nanocarriers for targeting in inflammation. Asian J Pharm Clin Res 2013; 6: 3-12. Christine TN: Nanotherapeutic approaches for the treatment of rheumatoid arthritis. Wiley Interdiscip Rev Nanomed Nanobiotechnol 2011; 3(6): 607-619. Chen CY, Liu ZD, Liu JJ, Chang WT, Ho OS and Sheu TM: Development of terbinafine solid lipid nanoparticles as a topical delivery system. 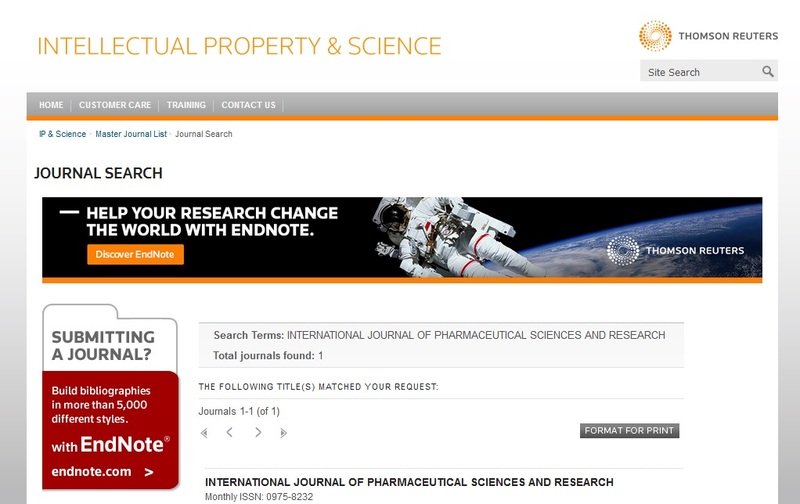 Int J Nanomed 2012; 7: 4409-4418. Soni MP, Shelkar N, Gaikwad RV, Vanage GR, Samad A and Deavarajan PV: Buparvaquone loaded solid lipid nanoparticles for targeted delivery in theleriosis. J Pharm Bioall Sci 2014; 6: 22-30. Sharma KV, Diwan A, Sardana S and Dhall V: Solid lipid nanoparticles system: an overview. Int J Res Pharm Sci 2011; 2(3): 450-61. Muller RH, Madar K and Gohla S: Solid lipid nanoparticles (SLN) for controlled drug delivery- a review of state of the art. Eur. J. Pharm Biopharm 2000; 50: 161-77. Dhoranwala KA, Shah P and Shah S: Formulation, Optimization of Rosuvastatin Calcium-Loaded Solid Lipid Nanoparticles by 32 Full-Factorial Design. Nano World J 2015; 1(4): 112-21. Gambhire MS, Bhalekar R M and Gambhire MV: Statistical optimization of dithranol-loaded solid lipid nanoparticles using factorial design. Braz. J. Pharm. Sci 2011; 47(3): 503-11. Priyanka K and Sathali A: Preparation and Evaluation of Montelukast Sodium Loaded Solid Lipid Nanoparticles. J Young Pharm 2012; 4: 129-37. Jenning V, Gysler A, Sch Afer-Korting M and Gohla S: Vitamin A-loaded solid lipid nanoparticles for topical use: occlusive properties and drug targeting to the upper skin. Eur. J. Pharm. Biopharm 2000; 49(3): 211-18. Vijayan V, Jayachandran E, Anburaj J, Rao SD and Kumar J K: Transdermal Delivery of repaglinide from solid lipid nanoparticles in Diabetic Rats: in-vitro and in-vivo studies J. Pharm. Sci. & Res 2011; 3(3): 1077-81. Lason E and Ogonowski J: Solid Lipid Nanoparticles - characteristics, application and obtaining. Chemik 2011; 65(10): 960-67. Guerrero QD, Fessi H, Allemann E and Doelker E: Influence of stabilizing agents and preparative variables on the formation of poly(D, L-lactic acid) nanoparticles by an emulsification-diffusion technique. Int J of Pharm 1996; 143(2): 133-41. Leroux JC, Allemann E, Doelker E and Gurny R: New approach for the preparation of nanoparticles by an emulsification-diffusion Eur J Pharm Biopharm 1994; 41: 14-8. Lae J, Chen J, Lu Y, Sun J, Hu F and Yin Z: Glyceryl-monooleate/poloxamer 407 cubic nanoparticles as oral drug delivery systems: In-vitro evaluation and enhanced oral bioavailability of the poorly water-soluble drug simvastatin. AAPS Pharm Sci Tech 2009; 10(3): 960-6. Souto EB and Muller RH: Application of lipid nanoparticles (SLN and NLC) in the food J Food Tech 2006; 4: 90-5. Schubert MA and Muller-Goymann CC: Solvent injection as a new approach for manufacturing lipid nanoparticles-evaluation of the method and process parameters. Eur J Pharm Biopharm 2003; 55: 125-31. Abdelbary G and Fahmy RH: Diazepam – loaded solid lipid nanoparticles: Design and characterization. AAPS PharmSciTech 2009; 10: 211-19. Ekambaram P and Sathali AA: Formulation and evaluation of solid lipid nanoparticles of ramipril. J Young Pharm 2011; 3: 216-20. Shah M and Pathak K: Development and Statistical Optimization of Solid Lipid Nanoparticles of Simvastatin by Using 23 Full-Factorial Design. AAPS Pharm Sci Tech 2010; 11(2): 489-96. Kesisoglou F, Panmai S and Wu Y: Nanosizing - Oral formulation development and biopharmaceutical evaluation. Adv Drug Deliv Rev 2007; 59: 631-44. Yadav SK and Sawant KK: Modified Nanoprecipitation Method for Preparation of Cytarabine-Loaded PLGA Nanoparticles. AAPS Pharm Sci Tech 2010; 11(3): 1456-65. Jenning V, Gysler A and Schafer-Kortiug M: Vitamin A loaded solid lipid nanoparticles for topical use: drug release properties. J. Control Rel 2000; 66: 115-26. Venugopala V and Jayachandranb: Transdermal Delivery of Insulin by Biodegradable Chitosan Nanoparticles: ex-vivo and in-vivo IJPS Winter 2011; 8(1): 315-21. Trommer H and Neubert HHR: Overcoming the Stratum Corneum: The Modulation of Skin Penetration: a Skin Pharmacol Physiol 2006; 19: 106-121. Syed A and Devi VK: Transdermal delivery of azathioprine by solid lipid nanoparticles: in-vitro and ex-vivo studies. Int J Pharm Sci & Res 2019; 10(2): 586-98. doi: 10.13040/IJPSR.0975-8232.10(2).586-98.